I was raised in a politically conscious household. Both of my parents, who grew up near Washington, DC, marched for various causes in the 60s from ending the U.S. involvement in Vietnam to Civil Rights. I grew up with tales of great civil rights leaders like Gandhi and Dr. Martin Luther King, Jr. as bedtime stories. The stories of these non-violent revolutionaries and their resolve to change the world resonated with me. I was the target of bullies as a child (like a lot of kids), but I never got in a fight. I never wallowed, I was never afraid. I wasn’t a “victim” of bullying because I never let it effect my sense of self-worth. It was the stories of civil rights leaders and their non-violent movement that gave me that resolve. We celebrate Dr. Martin Luther King, Jr. Day tomorrow, and it’s not a day to celebrate just one man. The holiday is a day to celebrate the legacy of everyone who has fought for civil rights, and if you are in Washington, DC you can march your way to many important and historic civil rights locations in the course of a day. I would start off the day in Anacostia with a tour of Cedar Hill, the home of Frederick Douglass, an escaped slave who became one of the most famous abolitionists in American history. Rangers from the National Park Service lead the 30-minute tours. I suggest ordering a reserve ticket, which costs $1.50 but gives you a set tour time. The picturesque home isn’t in the best part of town, so get a reserve ticket, get Uber to drop you off at the gate and pick you up when you are done. The media awaiting the decision on Equal Marriage. The hallowed halls of the Supreme Court of the United States have been the home to some the greatest civil rights failures, like Dread Scott, and the greatest triumphs such as landmark cases like Brown v. Board of Education. The court is open for visitors and tours Monday-Friday (except federal holidays). You enter through the plaza doors located at each side of the steps. You DO NOT enter through the big doors at the top of the steps. The plaza is wide open marble space you’ve probably seen in the media as you watch the running of interns, when young aspiring journalists bolt across it to their various media outlets when a big decision is coming down. You see, no phones or recording devices are permitted while the court is in session. You should journey 2.5 miles west to the memorial of who may be the greatest civil rights leader, though not a pacifist by any means, Abraham Lincoln. 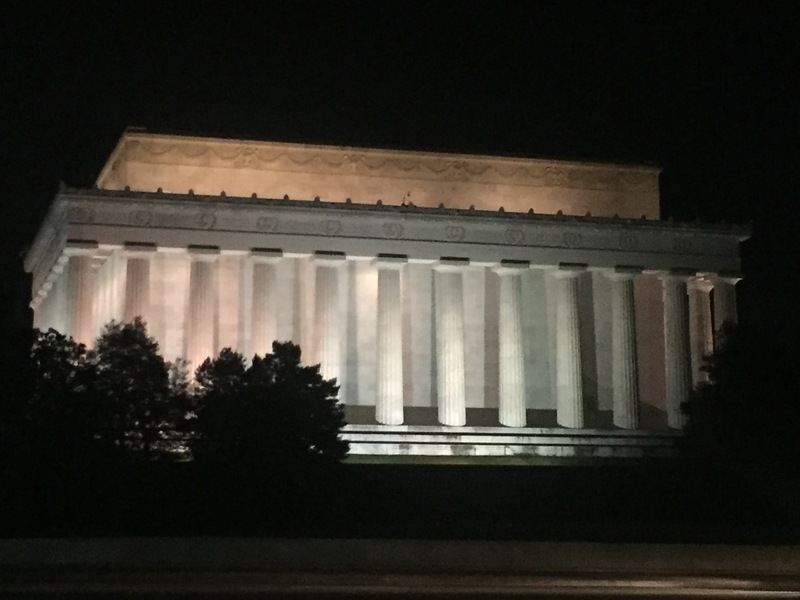 The Greco-Roman design has 36 columns representing the number of states in the union at the time of Lincoln’s death. The massive 16-foot statue of a seated Lincoln looking out over The Mall, and beyond that the Capitol, is flanked by engravings of his two most famous speeches, the Gettysburg Address and his second inaugural. The memorial is a monument to a man who truly took the weight of a nation and an entire people on his shoulders. The front steps are also the location where Dr. Martin Luther King, Jr. gave his “I have a dream” speech, there is a plaque on the steps marking where he stood. The memorial recently dedicated to Dr. King is just a few hundred yards away, surrounded by cherry trees in the Tidal Basin. The monument of King standing apart from the Mountain of Despair is called the stone of hope to reflect victory borne of disappointment. U Street in Northwest Washington has been the hub of African American life in DC for generations. There you’ll find the African American Civil War Memorial that stands to remind us of the 209,145 soldiers who served in the United States Color Troupes during the Civil War. The memorial is in the Shaw neighborhood, named for Col. Robert Gould Shaw of the 54th Massachusetts regiment made truly famous in the movie Glory, featuring Mathew Broderick, Morgan Freedman and Denzel Washington. I would finish the day at two spots just down the street, First grab a bite at famous DC eatery Ben’s Chili Bowl, the home of the half-smoke chili dog. Then you can head down to the Bohemian Caverns, a club where Duke Ellington once played, for drinks and jazz music.